One of the most well known physiological principles that govern physical training is the SAID acronym. The acronym stands for “Specific Adaptations to Imposed Demands”. It means that as the body is physiologically stressed, the systems of the body will adapt and change to meet the specific demands of the stressors. This works for all systems of the body including the cardiovascular, respiratory, neuromuscular, and musculoskeletal. When muscle tissue is stressed beyond what its normal capacity to respond to work is, the muscle tissue will undergo specific physiological changes. These physiological changes include an increase in the size of the myofibril (muscle fiber) resulting in an increase in both the size of the muscle and its capacity to contract (increase in strength). Different protocols of training can achieve different types of results. Individuals can choose a protocol that will achieve an increase in strength, an increase in endurance, an increase in power, or an increase in muscle size. The factors that are manipulated to achieve the specific results include the amount of resistance lifted (weight), number of sets, number of repetitions, and the speed of the movement. Research has long supported the fact that an increase in muscle size can be achieved through a protocol of high intensity resistance training. High intensity resistance training can be achieved in several different ways including lifting at a high percentage of the individual’s maximum lift (i.e., 70% of 1 maximum repetition), lifting sets to fatigue, as well as complex pyramid protocols in which individuals lift specific loads for high numbers of sets and repetitions. In a study published in the British Journal of Sports Medicine (December, 2003), Abe, T., Kojima, K., Hearns, C., Yohena, H., and Fukuda, J., studied the distribution of muscle hypertrophy after 16 weeks of resistance training. The subjects performed resistance training three days a week. They performed one warm-up set followed by three sets to failure of 8-12 repetitions. The resistance was increased when the subjects could lift more than 12 repetitions during a set. The authors used a full-body MRI to measure the total body muscle size distribution along with the cross sectional size of individual muscles. The researchers reported that their subjects had a 4.2kg increase in fat free mass after the 16 weeks. Although this was a higher gain than the average in the literature, their results did support the literature of a 5%-10% increase in lower extremity muscle size and a 15%-30% increase in upper body muscle after 12-16 weeks of resistance training. Abe, T., et al reported greater changes in muscle hypertrophy (increase in size) for the shoulder, chest, and upper arms (+25%-40%) compared to the waist, hip, thigh, forearm, and lower leg (+10-20%). Of interest is that the hypertrophic changes were not consistent throughout the body. This study utilized male subjects. It is important to note that hypertophic changes in muscle are not consistent between men and women after resistance training. Men have a higher level of the hormone testosterone naturally in their bodies. 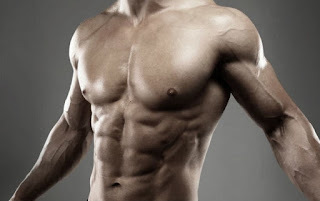 This hormone enhances the hypertrophy of muscles after resistance training. It is also important to note that testosterone levels vary in both men and women (to a much smaller extent) so that resistance training results are unique to each individual.